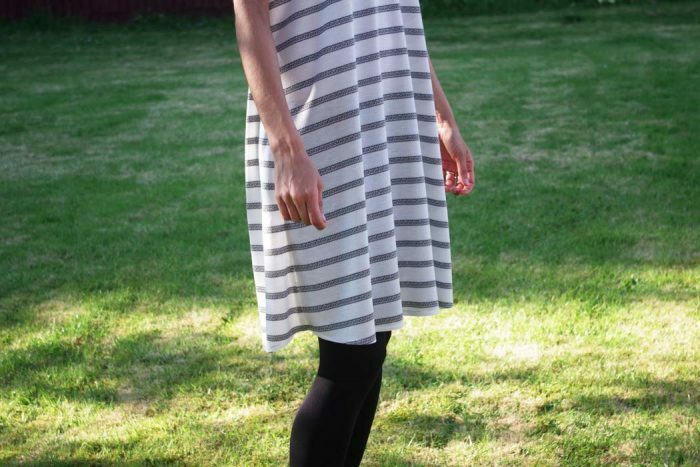 It’s Yasmeen here from _ym.sews_ to share with you a little hack I created from one of the newest Blank Slate Patterns releases, the Fairelith top. As soon as I saw this pattern I knew it would fit perfectly into my wardrobe, and it was just the kind of top that could see me through Spring and Summer. If you haven’t discovered this pattern yet, it’s a raglan sleeve knit top with a ballet neckline. 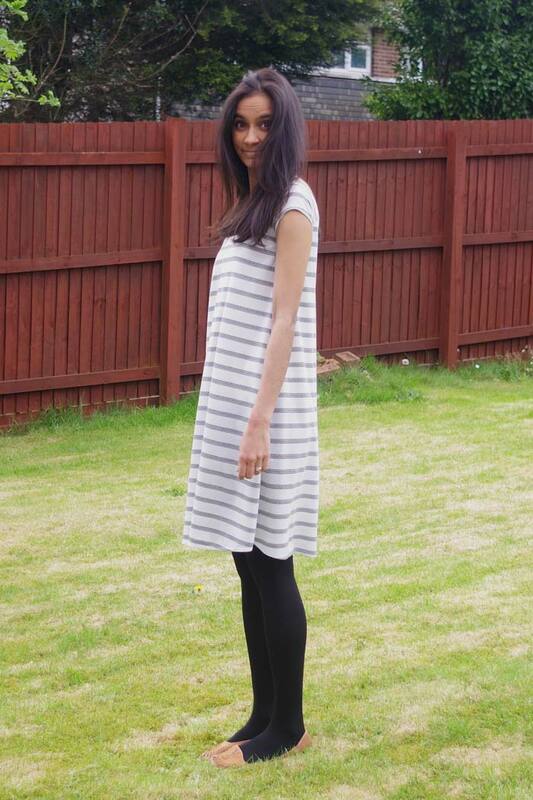 I have been thinking about swingy t-shirt dresses a lot recently and found the perfect striped jersey during a recent Goldhawk road meet up in London to create my vision. This jersey paired with the Fairelith pattern is such a perfect combo. To hack the Fairelith top into a swingy dress I used the swingy version of the top (the pattern includes both fitted and swingy bodice versions). I drew a vertical line parallel to the centre front of both the front and back pattern pieces and then across into the raglan neckline. 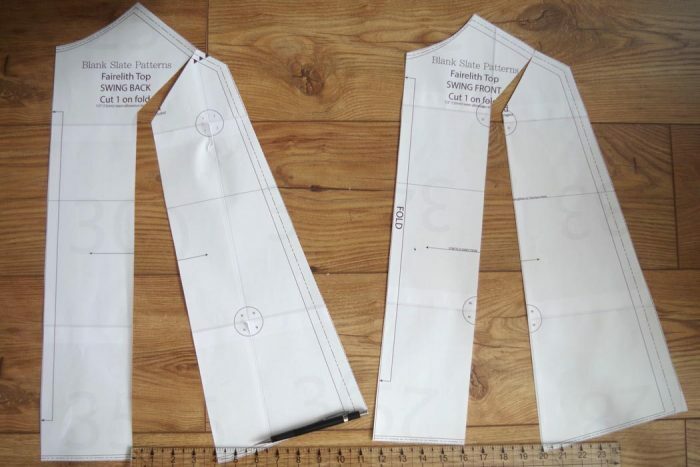 As you can see in the image below I then cut along this line almost to the raglan sleeve seam and spread the pieces apart. I widened mine by 4 inches and then stuck some paper behind to make the pattern pieces whole again as you can see in the images. 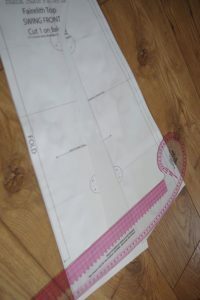 I then used a curved ruler to smooth the hemline back in place. This created a super swingy top pattern, and then I cut horizontally across the front and back and lengthened them significantly to create my dream dress! Construction-wise this pattern comes together really easily. This is one of the reasons I put such effort into matching my stripes. 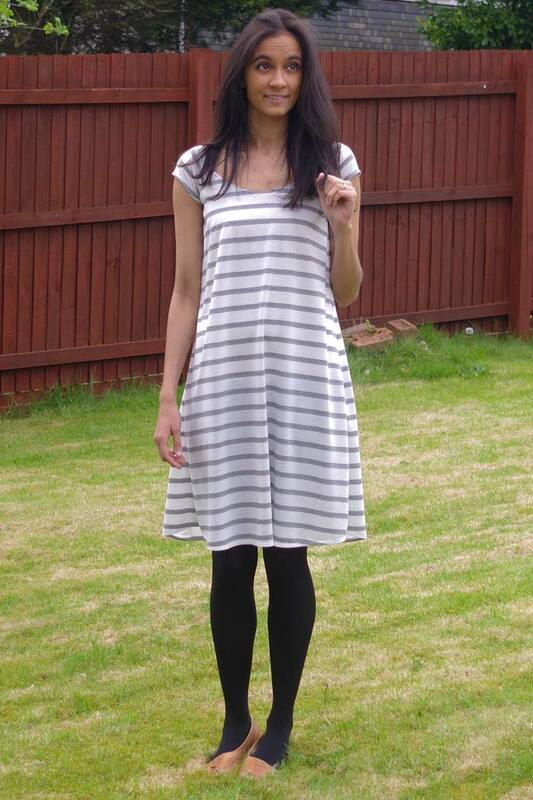 I just about managed to match the stripes on both side seams which I’m pretty pleased about! I didn’t use the neckband piece included in the pattern but instead turned the neckline and coverstitched the neckline down. I thought this gave less of a t-shirt look to my swingy dress.